Help your students understand how to Predict Products for Single Replacement, Double Replacement, and Combustion Reactions with this resource! 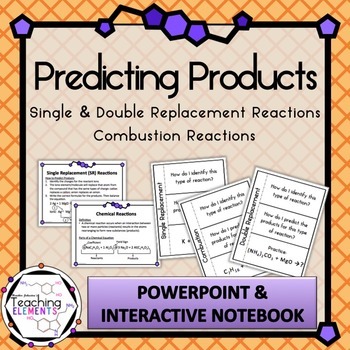 Use the Editable PowerPoint to discuss how to predict products for each type of reaction while students are keeping track with their interactive notebook pages! Want to include practice? Check out this resource and Save 25% Predicting Products Bundle. Or check out Predicting Products Puzzle Activity!